Back in early 2001, Steve Lindsay and I were having a conversation on the phone and the topic of engraving tools came up. Back then, I had no idea Steve had been working on anything outside of engraving let alone in the area of advanced tooling. He then asked me if I would be interested in testing a completely new air driven engraving tool that he had recently invented, a true pneumatic hammer that was non-spring assisted, called The Chasing AirGraver. Now at the time I was not aware of Steve's engineering and machining skills let alone his ability to create a revolutionary new engraving tool and machine it right there in his own shop. Being quite comfortable with what I had used for a very long time I naturally wondered how much of an improvement a new air hammer could possibly make, after all I had used a competitors tools for almost a decade and never gave a second thought to the possibility of a better tool. The more I listened to Steve the more I remembered how attentive he was to detail and that his precision was second-to-none therefore it was a pretty sure bet that if he had something to show me I ought to be looking into it; excitedly I agreed to test the AirGraver. When it arrived I hooked it up and was immediately impressed at how quickly I adapted to his system and any inconveniences that I had prematurely imagined were in reality not present. I knew one thing for sure I was not shipping this Chasing AirGraver back! Anyone who has read my first and second reviews back in March and June of 2002 know that I immediately was sold with The Chasing AirGraver; and then once again when he developed The Classic AirGraver, The Ultimate and so on. Those fortunate enough that have used any of the Lindsay AirGravers will tell you they are truly a joy to work with from the very first moment you try one. I can say that, seven years later having engraved everyday with his tools they are by far the best investment I have ever made. In addition to engraving, it has uses in other mediums such as stone setting or creating wonderful surface finishes or background effects. 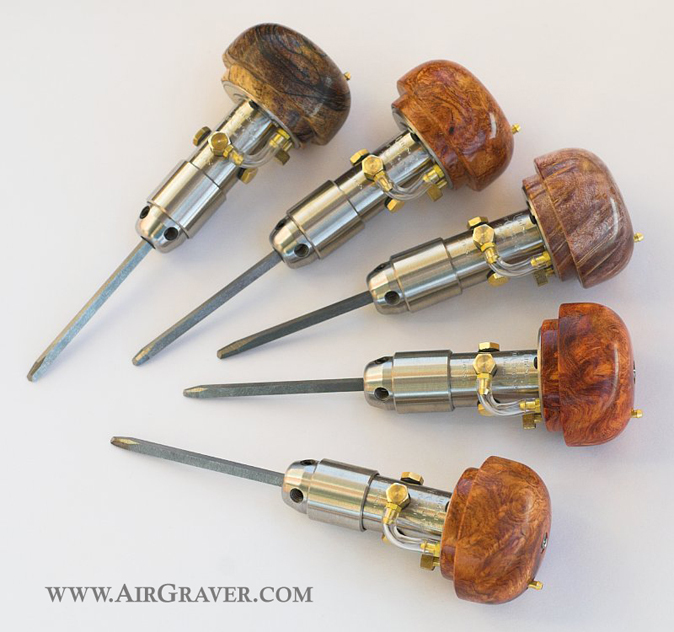 The AirGravers are extremely easy to operate and is a major advantage for beginners and professionals alike. I did not expect that he could improve on this system and further, but much to my surprise he did just that with the newest addition of The Palm Control. In 2008, Steve and I had another interesting conversation on what he intended for his newest AirGraver, I wasn't sure anything could improve an already superb tool. When I found out what it was I was excitement, he told me he believed he could eliminate the foot controller. 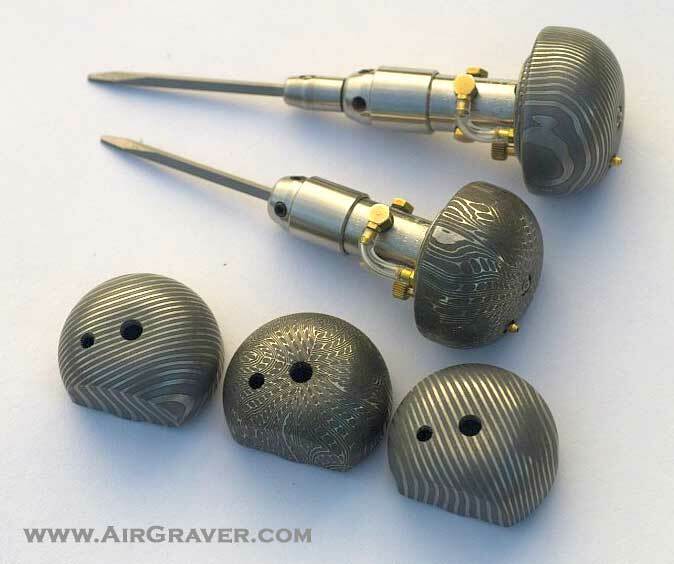 The thought of engraving without a foot controller was extremely appealing but at the same time hard to fathom it working properly being concerned that the graver might not have the same sensitivity. I played devil's advocate with Steve tossing all sorts of what ifs at him and he seemed to have an answer for all and truly believe it would work very well. I too began to believe he just might pull it off. This new idea was truly amazing yet still I wondered if it was too good to be true, could it really be as effective in the real world as it appears to be in the conceptual one? A few months passed and Steve and I spoke again and by this time he prototyped it and soon thereafter perfected it and put it into production. When I tried it I immediately called Steve and commented that the tool had exceeded every expectation I had imagined. It also surprised me by delivering more impact power than my Classic AirGraver. Steve explained it was because of a slight increase in mass due the Palm Control's handle and that this minor increase assisted the piston in delivering more impact power directly to the anvil. The Palm Control system considerably simplifies things by removing not only the pedal and its airlines, but also replaces the previous dual regulator with a single regulator system and the idle screw previously on the regulator is now self-contained as a thumbscrew on the Palm Control handle. This is just another example of why Lindsay Innovations are not just cool tools, they are downright intelligent, comfortable, and engraver friendly. The Palm Control is a genuine marvel of engineering, and is Steve Lindsay's latest contribution to the improvement of worldwide engraving standards and once again, he raises the bar one notch higher in Advanced Tooling. The best news is that if you already own a Classic AirGraver then a Palm Control is a simple upgrade done at anytime. Beginners will find this engraving system far easier than any other eliminating the time required to develop good hand/foot co-ordination that is required of all conventional pedal operated devices. Engraving becomes more enjoyable with less fatigue when using a Palm Control because it is no longer necessary to remain in a stationary foot position controlling a pedal for many hours at a time. This freedom ultimately translates into improved posture making engraving a more pleasurable experience. The Palm Control is remarkably responsiveness requiring only slight pressure against the palm handle to deliver gentle impacts that produces feather light cuts. By applying more or less pressure to the Palm Control handle as desired determines its impact power in conjunction with the piston stroke distance. The length of stroke adjuster sleeve is on the graver barrel and moves the internal anvil forward or backward in order to fine-tune the rate of impact by adjusting the distance the piston travels before striking the anvil. The length of stroke in combination with the Palm-push throttle, and the PSI setting, controls the power and sensitivity output throughout its entire range. The engraver is free to govern these features on the fly because unlike any other tool on the market they are all self-contained on the hand piece with exception to PSI air flow, and not as bench units as competitor models that clutter up small workspaces. It does not get any better than this being intuitive to our needs with styling, quality, and functionality. There must be a very good reason so many professionals worldwide are switching to Lindsay products, and not the other way around!